His name is Britton (“Britt”) Johnson. Reportedly born in Tennessee, Britt was a slave of Moses Johnson, who owned land in the Peters Colony (west of Dallas, in Young County). Unlike other slaves, Britt must have had some education. He was able to read and write and could manage basic accounting skills. Indians kidnapped Britt’s family, including his wife and daughters, during the Elm Creek Raid of October, 1864. His son was killed in that raid. Some sources say that Johnson searched for his family, and personally negotiated their release, after living with the Comanche for a time. Other sources say that friendly Comanches—specifically Comanche chief Esahabitu (Asa-Havey)— helped Britt by paying a ransom for the Johnson family’s release. However it happened, Britt’s family was released by the Comanche during June of 1865. On January 24, 1871, about twenty-five Kiowas attacked a wagontrain manned by Johnson and two black teamsters four miles east of Salt Creek in Young County. A group of nearby teamsters from a larger train of wagons reported that Johnson died last in a desperate defense behind the body of his horse. Teamsters who buried the mutilated bodies of Johnson and his men counted 173 rifle and pistol shells in the area where Johnson made his stand. He was buried with his men in a common grave beside the wagon road. Johnson’s fascinating story was turned-into a novel by Alan LeMay in 1954. He called it The Searchers. A significant difference between the real story and the adapted stories was the color of the star. A black hero became a white hero in both the book and the film. Lee Herring created his impression of what Britt Johnson must have faced on the day of his last fight. He has graciously allowed the "Texas Black History Preservation Project" to use his copyrighted painting for the story of Britton Johnson. The image, at the top of this page, reportedly depicts Britton Johnson. It is online via "Frontier Texas," a "western heritage center [located in downtown Abilene] that brings the Old West to life with the help of state-of-the-art technology." 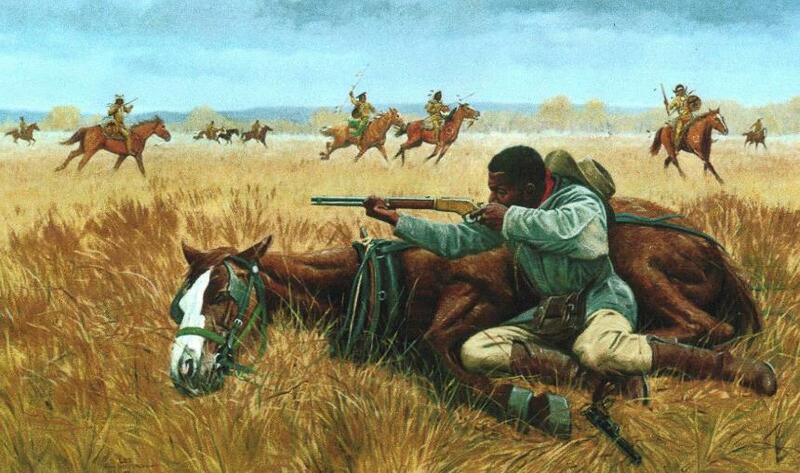 Image claimed to depict Britton Johnson, online via "Frontier Texas"
Image of Lee Herring’s painting, depicting Britton Johnson, copyrighted Lee Herring, all rights reserved. Image provided here as fair use for educational purposes and to acquaint new viewers with Herring’s work. Image online via the Texas Black History Preservation Project’s website. Bos, Carole "Britton Johnson - A Legendary Black Cowboy" AwesomeStories.com. Feb 26, 2015. Apr 25, 2019.